With special guest Kay Proudlove. Growing up in South Coast NSW’s fertile music scene, Corey Legge started playing music at a very young age and quickly established himself as a guitarist to watch on the coastal festival circuit with his band ‘The Swamp Stompers’. 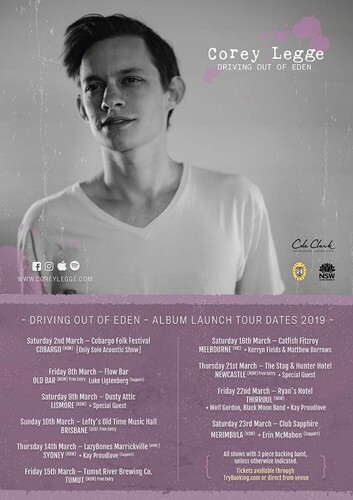 Fast forward a few years and Corey Legge has made the move to flex his musical muscle in a different direction with solo album ‘Driving out of Eden’. Legge has taken an introspective turn away from the grit of The Swamp Stompers on his first solo outing, allowing his writing to be influenced by the great songwriters he grew up listening to, including James Taylor, City & Colour, Passenger, and Bernard Fanning among others. The new album is rich in storytelling tradition and is heavily inspired by traditional Celtic folk music throughout. Tales of love, loss, and adventure abound, with the title track opening the record with some of the frenetic energy and wholesome intent of Dots era Paul Kelly. ‘Driving out of Eden’ succeeds as a melting pot of old school charm and modern pop sensibility, with as many quiet moments of reflection as there are raucous calls to arms. ‘Driving out of Eden’ was produced by award winning New Zealander Ben Edwards who has helmed recent releases by Julia Jacklin, and Marlon Williams. ‘Driving out of Eden’ is available online from 19th February.